Anticipation for Research In Motion's new BlackBerry 10 OS is reaching a fevered pitch ahead of the company's planned January event. As has been customary for any new technology or software, a handful of images of BB10's home screen have leaked. 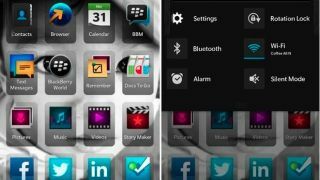 Consumers dying for their first look at what to expect from BB10 should find plenty to sate their appetite, as the images give a clear look at the user interface and potential launch applications for the first BB10 smartphones. Though an invitation-only beta test for RIM's government and enterprise partners did open on Monday, these new images give everyday consumers a glimpse inside what awaits. Everyday social networking apps like FourSquare and Twitter make an appearance on the home screen, as do Facebook and LinkedIn. The other apps present on the home screen include text and BlackBerry Messenger, as well as the standard media (music, video, pictures) and more practical apps like Docs to Go and Remember. The images also give the first look at BlackBerry Hub, BB10's new all-in-one messaging center which allows users to manage multiple email accounts, BBM, social networks and more all from the same portal. All of those features are outshone by the alluring appearance of what could be BB10's answer to Siri. Judging by the images, the voice activated app will allow consumers to use voice commands to send messages, set reminders and possibly more. Unfortunately, even though it looks like BB10 is going to work with a lot of familiar apps, and introduce a handful of new experiences, some developers won't be making the jump. Whatsapp confirmed it has no plans to support BlackBerry 10, but didn't indicate if that meant forever, or just in the short term. The developer also didn't reveal why a new Whatsapp wouldn't be created for BB10 in time for launch, but perhaps they are taking a wait-and-see approach to the new OS. Whatsapp will likely not be alone in not making the transition to BB10, but until the new operating system and phones actually launch, users will just have to hope their favorite apps will be part of RIM's new direction.